THANK YOU TO ALL WHO EXPERIENCED THE ECLIPSE IN THE COLUMBIA, S.C. REGION! One of the Southeast’s most vibrant mid-sized cities, Columbia, S.C., was home to the longest total solar eclipse for a metro area on the East Coast and hosted Total Eclipse Weekend Columbia, S.C., a long weekend of more than 120 eclipse-related festivals and events, from Aug. 18 to 21, 2017. VIEW KEY STATS & INFO FROM THE WEEKEND! Columbia, S.C., and its surrounding region were positioned in the best location – the best on the East Coast, in fact – to witness a spectacle that had not been seen in the continental United States since 1979, when a total solar eclipse was visible from five Northwestern states. Even more compelling, a transcontinental, total eclipse of the sun that passes from coast to coast had not occurred in the U.S. since 1918. 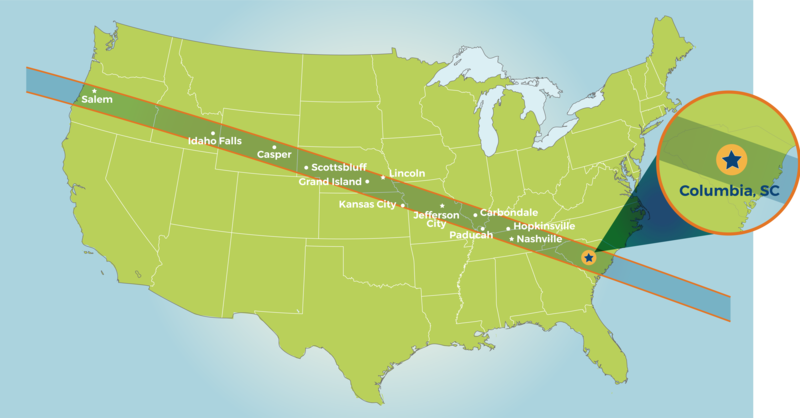 On August 21, 2017, a total solar eclipse was visible along a thin, roughly 70 mile-wide path that runs diagonally across America from Oregon to South Carolina. The difference between a partial eclipse and a total eclipse is monumental -- even the difference between a 99% eclipse and a 100% eclipse is remarkable enough to draw visitors from all over the globe when it occurs. Throughout the long weekend of August 18-21, 2017, attractions, cultural institutions, hospitality and retail businesses in Columbia, S.C. – the total solar eclipse capital of the East Coast – hosted more than 120 special eclipse-related events leading up to and during nature's grandest spectacle. CLOSE IS NOT CLOSE ENOUGH. Learn More About the Eclipse in Columbia, S.C.
At 2:41 p.m. on Monday, August 21, 2017, viewers who have gathered in the Greater Columbia, S.C., area experienced the longest period of 100% total eclipse for a metro area on the entire East Coast of the United States — ranging from 2 minutes and 30 seconds to 2 minutes and 36 seconds of total darkness. Experts estimate that this total solar eclipse was the most watched eclipse in the history of the world as we know it. Only those in the “path of totality” had the extremely rare, awe-inspiring experience of witnessing a 100% total eclipse. The Total Eclipse Weekend Columbia, S.C., initiative was created to serve as a central hub for information about experiencing the eclipse in the Midlands region of South Carolina. As a result, more than 120 eclipse-related events are being hosted across the region across the long weekend. 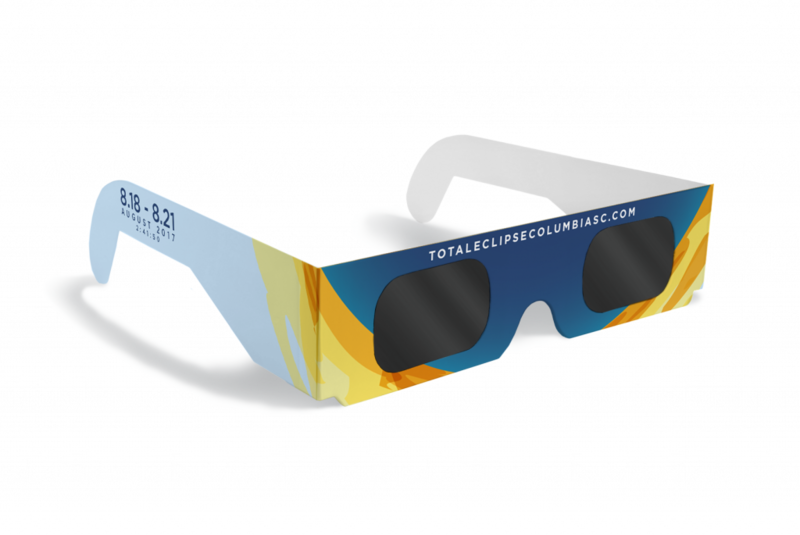 Protect your eyes with eclipse viewing glasses during the “before and after” partial eclipse phases, but remove your eclipse glasses when the sky goes dark during totality.